The 2nd guild I stayed with for a week or 3 (and then my account got banned ), but wasn't very active. I stayed because it was a 'low level' guild (22 when I entered) and wanted to see how guild-growth went in EverQuest II. But when I returned this morning, I was alone online, and checking the recent activity (a very good option in EverQuest II, showing it for the last day, week or month), and I saw that with me only 4 players were active lately and the last one to have logged on was 5 days ago More importantly, one girl (well, she claims to be girl RL, and after a chit-chat I do beleave her to be a her ) wasn't even one of the 4 of that last week. So time to leave them as well (too bad, can't see guild-growth now in EverQuest II). 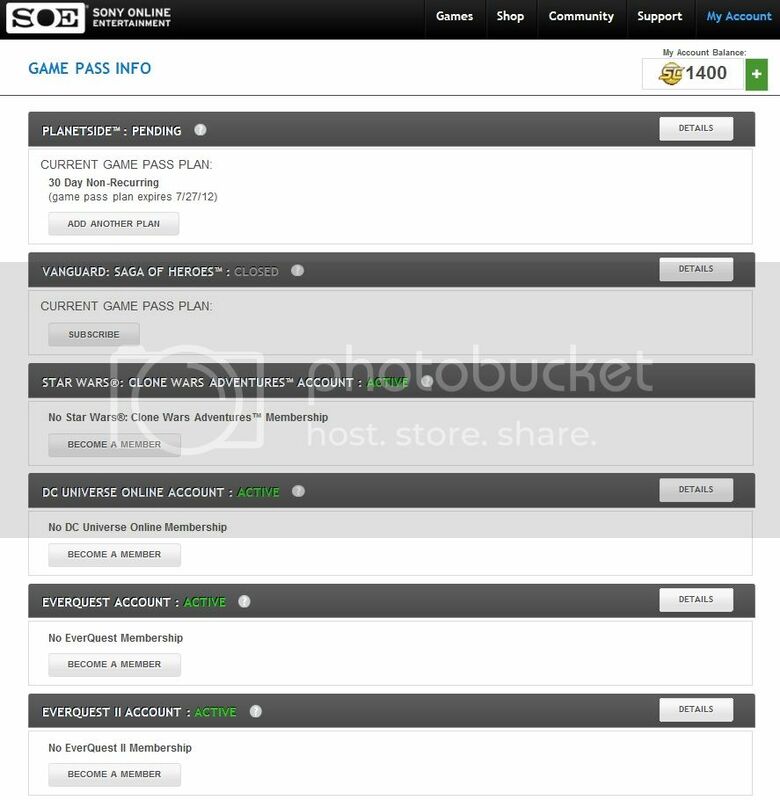 Two days later, my $O� support ticket about my account is still open (even after an update I made) and my account still banned, so I reply to the Global Collect eMail telling them that I still can't play and asking them to contact $O� for me. That they did (by exception BTW). Again 2 days pass, but I finally get an extremely short eMail from $O� support that my account has been released (and the ticket closed). Aside from 2 weeks not being able to play EverQuest II, there are a couple things that went wrong. Then there's still the 1 month PlanetSide subscription that's running. An other thing I won't bug them about since I'm totally not interested in that crappy game. I do like EverQuest II, but I most certainly dislike $O� even more than I already did. Luckily the European services will be handed over to ProSevenSat.1 Games in about 30 days. Though I have little fate in them (they have 7Games), I will be able to keep playing on the US servers, so only the way to logon will be a bit different I guess. I do hope that their customer service will be better than $O�'s and their subscription as good as that what $O� offers. The payment I had to make was directly into GlobalCollect's account under a specific reference. But after a couple of days when I tried to trace that payment on GlobalCollect's website (with the reference ID used), the payment was totally unknown. Calling GlobalCollect myself didn't fix the problem either, but they did make a ticket to resolve my problem. Well, it looks like $O� doesn't hold any interest in my account anymore since June 29th when they lastly updated the status of my 'Customer Service support' ticket. Where they used to respond within 48 hours, things seem to go back to the previous account problems that I had and (as predicted), $O� has lost track of my ticket and it's not looked at anymore. 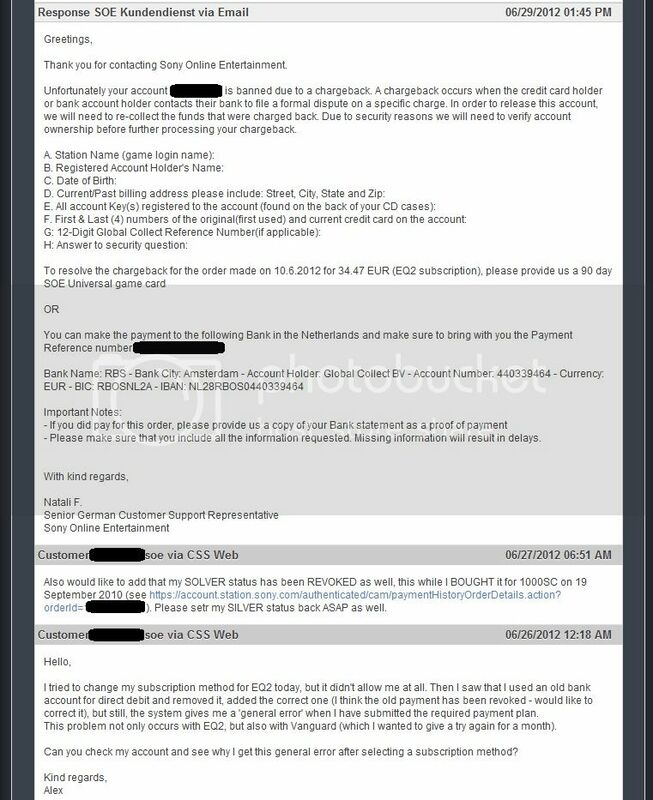 But as I've said twice already in my 'Customer Service support' ticket, I will cancel ALL PAYMENTS I've made for $O� the last 6 months by creditcard and they can shove their games. Though I hope it won't come to it, it's getting awfully close to the creditcard payment day, and if by that time $O� hasn't solved my account problems by both lifting the ban of my EverQuest II account as well enabling to resubscribe again (as if I will EVERY resubscribe to $O� games again...), payments will be revoked by me. Oh yeah, and in my last ticket update I did warn them to SPAM social media with warnings to other players about $O�'s 'great Customer Service'. My advice: DO NOT PLAY $O� GAMES EVER AGAIN, OR AT LEAST DO NOT PAY THEM A DIME! At times I wonder how SOE works with their customer service and management. Having trouble with my account for the last few days, today I received the message that my account was (temp) banned due to the charge back that happened. 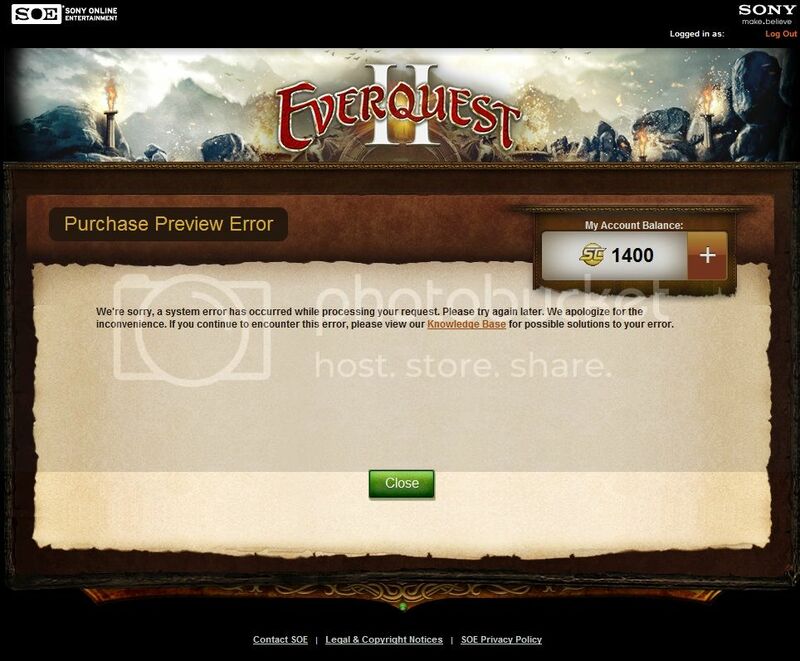 Lets hope SOE will solve this ticket quickly, so that I can play EverQuest II again. But knowing SOE's customer support with my previous account problems, it might take them some time (4 months at the time) to correct any errors on my account. What happened..? Well, I took a 3-month EQ2 subscription and by accident I used an old account-number for the direct debit (this also might explain the weird password errors I had lately). When I found out about my error, I made it a support ticket, telling them of my mistake, and asking them to correct it so that I can resubscribe with the right account-number. Well, SOE did to part of my request of the support ticket. The subscription has been removed, but the error I get when trying to make a purchase is still there. No matter what I do or try, I'll end up with the above error. 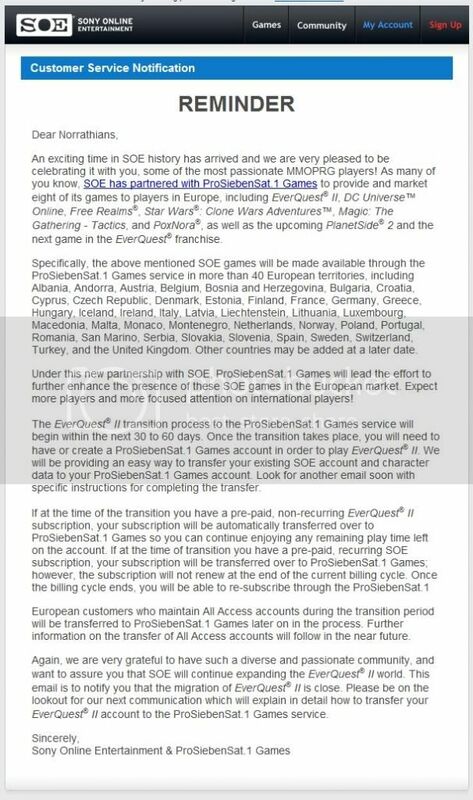 Trying to subscribe to Vanguard: Saga of Heroes (which I wanted to try for an other month) gives it, and renewing my subscription for EverQuest II (I want to add a year's subscription this time) gives it as well. Oddly enough, all of a sudden I do have a running subscription for Planetside for which I've never taken a subscription. One of the best (as well as unique) features EverQuest II offers is that the player can determine his leveling speed after hitting level 10. You can do this by adjusting the amount of XP that is spend on Alternate Advancement (AA). So far (up to level 28 for me now), I still thing that the leveling speed is too high. There initially I've set my AA gain to 50%, I recently increased it to 75%, and only recently even to 90%. This means I will gain a HUGE amount of Alternate Advancement points (of which half I most likely can't spend right now because I don't have the skills yet top assign the AA to), but at least I can do the quests I want to without my level getting way too high. But even with the high AA setting of 90%, I still think I'm leveling too fast. Right now I'm playing in and around the Nektulos Forest to get my level 20 class armor set (I only learned about it on level 24, which means I've gained 4 levels to get it...). And now I'm talking about the AA gain, I remember chatting with a guild-member this weekend. She has set set AA gain to 100% and is stuck on level 50 now, enjoying most of the content there is (which is a lot!). We've agreed that when I hit 50, I will set to 100% AA gain as well and we'll team up doing most of the stuff to do. This means I have only 22 more levels to go before I'm 'stuck' on 50. Of course, I could not let him kill me without revenge. I went back, this time with the war-boar out and went all through the raid again solo. This time things went a lot smoother (damn, that war-boar is a real tank and gives nice heals as well) and I managed to kill Lord Ree and had some awesome loot (including a fabled humming reactant). At creation, the Beastlord starts with an offensive pet (called warder), which differs from race to race. As Arasai I started with a bat and it did do some nice damage. After upgrading the Age of Destiny expansion to Collectors Edition, I also received a war-boar as pet, which is more a tanking pet. One thing bothered me from the start. Though the pet does some nice damage, I wasn't able to control it, other than to command it to attack (and other basic functions). This while on the warder's tab it shows to have 4 skills already. Asking around (in global chat), I learned that on level 18 I'd get a new hotkey-bar for the warder so that I'd be able to control it (more about it later on). Then about the strength of the Beastlord class. I've been walking around in the Wailing Caves on level 18 (and up) and a bit in the Forgotten Gates on level 21 (and up), and I have to say, with all these strong heroic monsters out there, the Beastlord did good damage and was able to survive up to 3-4 monsters at a time. That is WITHOUT the use of healing potions or food that heals during combat (I do need to get some of those though). This means that with the right warder used, the Beastlord is quite a powerful class (so far), but you do need to keep track of your equipment and be sure your armor rating will be 'up-to-date' with your level. An other nice thing about the Beastlord is that you can tame your own monsters (much like the Hunter does in World of Warcraft). By now I've tamed an avian (which does not yet fly though), a canine and a feline. Personally I like the feline most as offensive pet and use the war-boar as defensive pet. I'm no lover of a cash-shop in any (subscription based) MMORPG. I'm against the ones in Lord of the Rings online and EverQuest II as well for the same dislike of it, and normally I just leave them as they are (stocking up TP in Lord of the Rings online BIG-TIME), unless there's something I really need (like storage expansions in Lord of the Rings online). Yes, I bought a rather huge squirrel as mount. This mount is a so-called 'glider' (think it's much like the feather-fall the Fye and Asarai have). Though the gliding ability is not available yet (it's level 30+ or 60+ iirc), I just thought the squirrel was very cute to use as 'appearance skin' for my current mount. Yes, indeed! In EverQuest II you can use an other mount's appearance as 'skin' for the actual one you're riding. In my case, I'm riding the Winter Wolf (bonus from an earlier expansion) where I have all it's statistics and bonuses, while you see that cute squirrel.